Palestinian amora of the third century. In Palestinian sources he is called only by his personal name, but in the Babylonian Talmud the name of his home in Judea is always added, in order to distinguish him from an older Babylonian amora who bore the same name. 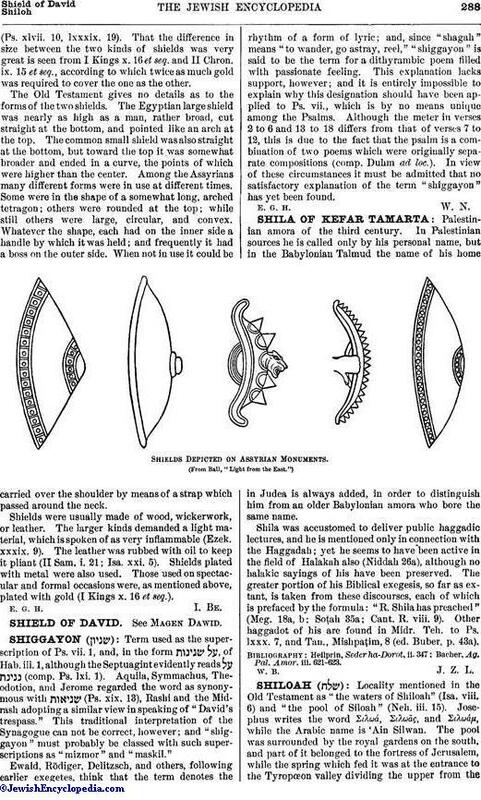 Shields Depicted on Assyrian Monuments. Shila was accustomed to deliver public haggadic lectures, and he is mentioned only in connection with the Haggadah; yet he seems to have been active in the field of Halakah also (Niddah 26a), although no halakic sayings of his have been preserved. The greater portion of his Biblical exegesis, so far as extant, is taken from these discourses, each of which is prefaced by the formula: "R. Shila has preached" (Meg. 18a, b; Soṭah 35a; Cant. R. viii. 9). Other haggadot of his are found in Midr. Teh. to Ps. lxxx. 7, and Tan., Mishpaṭim, 8 (ed. Buber, p. 43a). Bacher, Ag. Pal. Amor. iii. 621-623.